Mix and Chic: Book review- The New Braiding Handbook: 60 Modern Twists on The Classic Hairstyles! Book review- The New Braiding Handbook: 60 Modern Twists on The Classic Hairstyles! You might not realized this yet but to be perfectly honest, I have always been mesmerized by beautiful hairstyles. When I see women with beautiful braids and up-dos, I always have major hair envy and would often wonder how they style them. So when I was offered The New Braiding Handbook: 60 Modern Twists on the Classic Hairstyle to review, I immediately said yes! 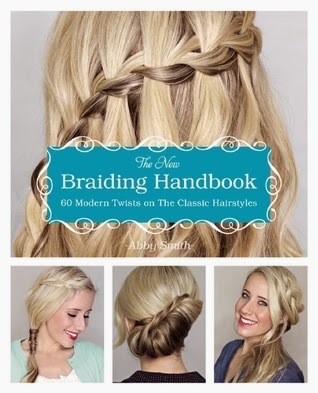 In the 135-pages book, author Abby Smith showed us 60 modern braids for all occasions. When she shared how she can barely style her hair at first but later decided to teach herself all about hair styling, she spent hours upon hours in front of her bathroom mirror trying to figure out how to do basic braids, I feel more inspired to learn. In her own words, she said, "This book is proof that if I could do it, so can you. I believe that styling hair isn't a talent. It's a skill." I think she might be right. I am going to need lots of practice and try to master at least one or two of my favorite hairstyles to change the look of my hair, pronto. Intrigued? Here is a sneak peek of the content you will find inside the book! I love this fabulous book! This book is essentially a modern, wonderful collection of easy-to-recreate, gorgeous and versatile hairstyles for elegant formal events to chic, casual, everyday wear. Simple and straightforward, I find the step-by-step pictures and detailed instructions for creating beautiful braids, trendy knots, chic twists and playful plaits quite easy-to-follow! Valuable hair care and many hair styling tips were also included in this book as well. I can think of so many occasions one can wear the lovely hair styles from this book such as during proms, graduations, weddings, formal dinners, parties, special occasions, date nights, work places, photography sessions, etc. This is truly a good quality hair styling book, I would definitely recommend this book to anyone who wants to learn about effortless looking, pretty hairdos! You can get your copy here! Happy braiding!